at the Indian River Civic Center, 4220 S. Hopkins Ave. Titusville. 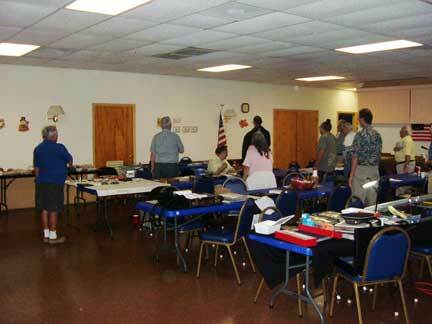 The Titusville Coin Club celebrates its 50th anniversary in 2010. We are the coin club by the launch pad! Just a few blocks from the Indian River, one can see the NASA launch facilities across the way. Welcome to our web site. 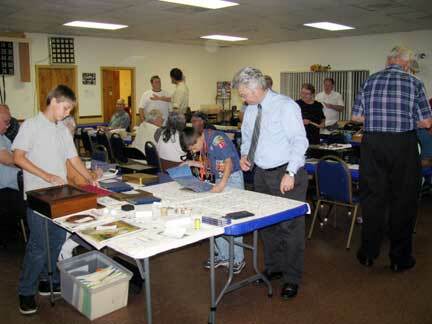 The Titusville Coin Club is dedicated to promoting the hobby of coin collecting. Our meeting officially starts at 7:30 pm, but members usually begin arriving at 6:00 PM to setup a table or to trade, buy or sell coins and currency or to just exchange ideas. 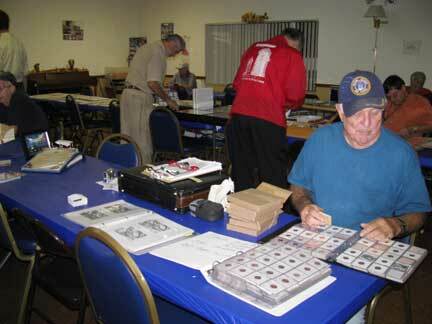 The club has several members who are coin dealers, several of whom, bring material for sale to the meeting. They will gladly help members evaluate coins on their authenticity, condition, grade, and their value. After the opening Pledge of Allegiance, a very short business meeting is held to bring everyone up to date on what is happening in the club. There are two main highlights at every meeting; the auction and the raffle. Members can offer items in the auction as well as bid on desired items. It is not at all unusual to have a winning bid far below retail value! The raffle always offers high quality and high value prizes and everyone buys tickets to win! Almost always, the raffle is totally gold and silver coins. Other highlights include the refreshment break and the member attendance award at the end of the meeting! Some meetings are extra special when a guest speaker offers a program on some topic in numismatics. Sometimes we give a self graded test on a current topic; always a learning experience. For example we had a test on Abe Lincoln when the new "Lincoln Cents" were introduced in the Spring of 2009. Some of our members were the ones who discovered several of the die varieties of the 2009 Lincoln cents! For our December meeting the club provides a lavish Christmas dinner. It's also the night of our gold coin attendance prize. In addition we hold a very special raffle and auction. It is also the night for our famous "Pig In a Poke" auction item. The dinner is partially potluck with the club providing the featured main courses and drinks. The club is a member of F.U.N. (Florida United Numismatists) and the A.N.A. (American Numimatic Association) and as such participates in the programs and activities of each organization. The club sponsors four coin shows each year that are held at the Searstown Mall. These shows support our dealers and more importantly provide a venue where coins and currency items are available to all attendees. If you have a collection that you want to dispose of, the club can suggest people to appraise and/or buy your collection. Membership is $10 per year ($5 for junior members). If this sounds interesting to you and you would like to learn more about coins please consider attending a few meetings as our guest, and if you like the experience, please join us. Your Titusville area business web site, web page, or web card on this Community Directory. We can register, produce, host and market your Internet presence. LOTS TO DO in North Brevard. We challenge you to discover them!